Greeting Cards Blog March 2005 - This is an archive page of all my blogs in March 2005. Read what happened in my life and to this website in March 2005 here. Attended church in the morning - usually I go for the evening service but since it's Easter, I went for the morning service and it's was real crowded. So different from the evening service. Then I spent the rest of the day with Ruyi and her parents at her home. Well, she's another card maker. I viewed some of her artworks and handmade cards and am impressed by her creativity for a 4 year old girl. 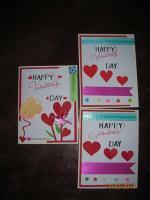 Will post them on the Kids Card Making page. I have been cleaning the pages here - looking for broken links, tidying up pages. Notice that the Homepage is neater and shorter. Will have to check on the Sitemap tomorrow and update it. Some pages are not listed - pages I added the past week. Another new page - Card Making Ideas Using Your Japanese Rubber Stamps - has been uploaded to the site. These rubber stamps card projects are my favourites. I just love rubber stamps art and would love to spend all my spare times thinking up ideas of incorporating these rubber stamps images into my card making.